We are very pleased to note recent awards to students in Typography & Graphic Communication. Undergraduates Kate Goudsmit and Rob Lowe, currently in their final year of study, together with Ryan Lee and Peter Loveland, in their second year, all received the Chancellor’s Award for their overall performance in the academic year 2012–13. Sir David Bell hosted the award ceremony on Monday (25 November) and commended their high achievement. Award winners received a commemorative book featuring short interviews with each recipient. Warm congratulations to our four winners! 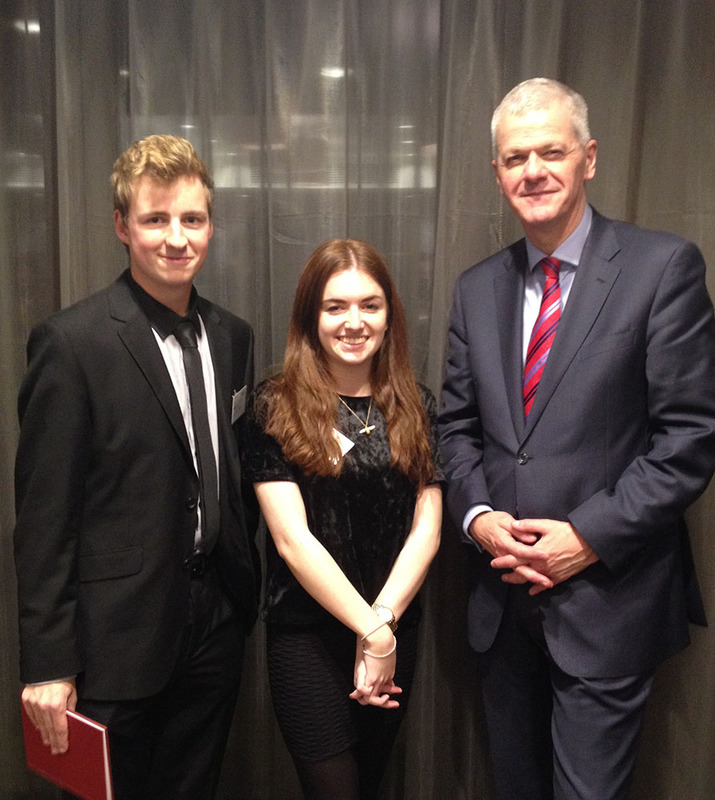 Rob Lowe and Kate Goudsmit with Sir David Bell. Undergraduate Emily Whiteside, currently in her final year of study, was awarded a commendation for her submission to the Student Work category of the annual Sign Design Society awards. The submission was her ‘Designing a journey: the Chatsworth Shuttle’ project, completed under the direction of project tutor Sara Chapman. In their comments, the judges praised ‘the expertise and evident quality of the solution’, which involved the design of a map and timetable for the Chatsworth shuttle bus service, deployed as a poster, flyer, and downloadable app. Emily Whiteside’s entry to the Sign Design Society awards. Warm congratulations to Emily and Joan, too! More about the SDS awards.